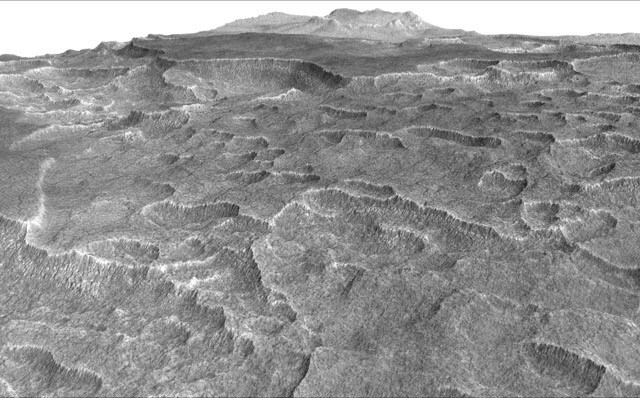 November 22, 2016 – Frozen beneath a region of cracked and pitted plains on Mars lies about as much water as what’s in Lake Superior, largest of the Great Lakes, researchers using NASA’s Mars Reconnaissance Orbiter have determined. SHARAD is one of six science instruments on the Mars Reconnaissance Orbiter, which began its prime science phase 10 years ago this month. The mission’s longevity is enabling studies of features and active processes all around Mars, from subsurface to upper atmosphere. The Italian Space Agency provided the SHARAD instrument and Sapienza University of Rome leads its operations. The Planetary Science Institute, based in Tucson, Arizona, leads U.S. involvement in SHARAD. JPL, a division of Caltech in Pasadena, manages the orbiter mission for NASA’s Science Mission Directorate in Washington. Lockheed Martin Space Systems of Littleton, Colorado, built the spacecraft and supports its operations.